Line the bottom of an oiled 8×2-inch round cake pan with 2 rounds of parchment paper. Dust the pan with one tablespoon of the rice flour, knocking out excess. Place blackberries in 1 layer on the bottom of the pan and drizzle with 2 tablespoon of the maple syrup. Sift together remaining flours, baking soda, baking powder and salt and set aside. Separate eggs. In a medium mixing bowl, beat egg yolks until light yellow then combine with oil, remaining syrup and vanilla extract. Alternately add egg mixture and milk to flour mixture, blending after each addition. Beat egg whites until stiff peaks form and gently fold them into the batter. 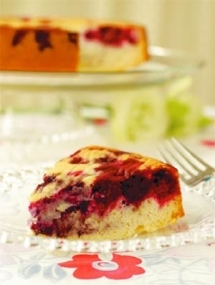 Spoon batter evenly over berries, smoothing the top, and bake in middle of oven until top is golden and knife inserted in the center of cake is clean when removed, about 30—35 minutes. Let cool for 5 minutes, run a knife around edge of pan, then invert onto a large platter or cake plate. Peel off parchment and serve warm with ice cream or an alternative.